Place the chicken and vegetables in a large mixing bowl. In a separate small bowl, whisk together the oil, lemon juice, and spices. Pour the dressing over the chicken and veggies and toss to combine. 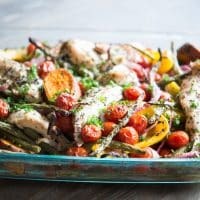 Pour the seasoned chicken and vegetables into a large casserole dish. Bake at 375 F for 45 minutes to one hour, or until the sweet potatoes are cooked through (easily pierced with a fork). If the vegetables on the top start to brown too quickly, simply place a sheet of foil over the top for the duration of the cooking time. Once finished, let cool a bit, garnish with the optional parsley, and enjoy!